EML 300B Mesh Data sheet. Not just a replacement, but an improvement! The 300B-mesh can replace a standard 300B in several cases, but not in all cases. So please read this data sheet carefully. The 300B mesh is a "long Anode" version, and the Anodes are 25% longer as with normal 300B we build. The physical size of this tube, inside and outside is the same as the larger 520B tubes we make, so it is much larger than you may expect from a 300B. Check the dimensions at the end of this Data sheet. The heat dissipation of the wire mesh is lower than for Solid Plate anodes. So the maximum Anode dissipation of the 300B Mesh for continuous use must be limited to typical 22Watt, or absolutely maximum 28Watt. This is however a classical use condition in several Japanese products. Though many other amplifiers exceed this number, so it is important to check with your amplifier manufacturer first, if you are not sure about the Anode dissipation. Why Mesh Anodes? When a tube is given mesh Anodes, something magic happens to the sound! We believe this is caused by the better damping properties of the wire mesh material. A Solid Plate anode due to it's circular construction will have quite some ringing (bell like effect). A mesh anode will not have this effect. In most cases, when using mesh tubes, you will experience a more transparent sound stage, meaning a more realistic stereo reproduction of the original sound recording. With mesh tubes you will enjoy the very best of what small triodes have to offer. Note: mesh means woven metal wire. Chinese factories make a tube with punched Anodes, and for marketing call this "mesh". A punched Anode from solid metal will also have this ringing effect, and can never have the superior resonance damping properties a wire mesh tube has. Gray Wire Mesh Anodes, mounted on a hard metal frame for best stability. * For best lifetime, it is recommended to choose maximum 26 Watt Anode dissipation, though 28 Watt is possible at some compromise with life time. If you need higher output power than 300B-Mesh can do, choose standard 300B, or upgrade to 300B-XLS. Choice of output transformer impedance: For each working point, a wide range of primary impedance is possible. When using a transformer of another value, you can estimate the output power and distortion by averaging between two rows of this table. Example: 450V, 60mA. Use of Lundahl LL1679-70mA (4k5 type). This will give you appr. 11.5 Watt @ 27dB 2nd harmonics. (28dB distance of signal to 2nd harmonics. Download these curves as PTE file - What is that? Note 1) This tube has gold Anoded grids, and additional to this it has several other new features, that we do not to publish for competition reasons. The result of this is, if a tube like this gets accidental overheated, the risk on damage is greatly reduced, compared to classical tubes, and compared to tubes as we produced them before. 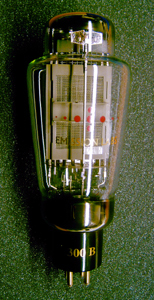 As end-user you can recognize a tube of this series by the gold Anoded grid. The gold color of the grid is visible with the bare eye, when you look carefully. We do not say you can overheat this tube, but chances on damage are greatly reduced in case it would happen anyway by mistake.